This year, National Train Day is May 9th, the day before Mother’s Day. The day I should be out buying flowers for the cats to eat and meat to burn on the grill. Actually, I’ve got Mother’s Day covered, but I’m choosing to write about the music of trains as I try to find the best song to commemorate the day. I don’t know how many songs have been written about trains and I surely don’t know how many artists have sung those songs. I chose the title in honor of Hank Williams Sr. but in all honesty, I don’t like the song. You can listen here, but it’s a little too old school country for me. I don’t like sad train songs or mournful train songs. About the closest I come to that is John Prine’s rendition of “Paradise” which is technically more of a protest song than a train song. The other more melancholy train song that I do like is Arlo Guthrie’s “City of New Orleans.” Actually, it wasn’t written by Arlo Gutrie, it was written by Steve Goodman and famously performed by Willie Nelson, but it’s Arlo’s version people remember. Similarly, I absolutely fell in love the first time I heard Rosanne Cash’s version of “Runaway Train” even though it was written and had been performed earlier by John Stewart. People write songs but sometimes other people perform them better. I own “Runaway Train” on a variety of media and it’s on half a dozen mix-CDs in my car. Ever since I first heard her perform that song, I’ve used the expression “we’re lighting the fuses, and counting to three” as a metaphor for projects that may not end well. Gordon Lightfoot has a bunch of train songs, including his epic “Canadian Railroad Trilogy” and “Big Steel Rail.” I enjoy both of those, but the song where Gord mentions a train that I like the most is “The Watchman’s Gone,” also melancholy but I honestly get the feeling that he could “climb aboard unseen” and I share the feeling of riding the rails like a hobo whenever I hear that song. The Doobie Brothers offered up one of the most confusing train songs ever with “Long Train Runnin.” I was never sure if that was a train song or a love song or perhaps, a love of trains song. I also think it’s one of those songs that makes less sense as you sober up. 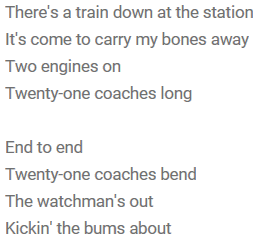 If you happen to be less than sober, or otherwise impaired, you are ready to sing along with another great train song, “Casey Jones” by The Grateful Dead. Come on, I know you know the chorus. Of course, the more traditional train wreck song would be the “Wreck of the Old 97” and I prefer the version by Flatt and Scruggs, ‘cuz, you know, more banjo. I would be remiss if I didn’t at least consider a gospel song in the list and there is no shortage of them. If you’re interested in one, I’d give a listen to “This Train” by Sister Rosetta Tharpe. 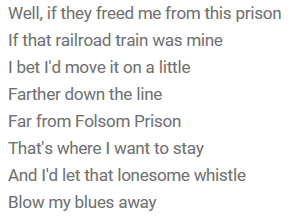 One of my favorite kinda-sorta train songs, one that I like to sing along with in the car, and one that will eventually cause me to get a ticket, “Folsom Prison Blues” by Johnny Cash. If I wasn’t thinking about lyrics today, which I am, I’d go with “The Orange Blossom Special” by The Charlie Daniels Band. I know, hundreds of well-known and wanna-be well-known musicians have performed and recorded that song, but seriously, Charlie Daniels. If a train song didn’t have to be really upbeat and happy, I would consider “Steel Rails” by Alison Krauss. It’s an optimistic song, but it’s just not powerful enough to celebrate this most important of days. For National Train Day, I don’t think any of the songs mentioned above will really do, although I’ve listened to all of them while writing this and I’ll probably listen to all of them again after I push publish – you know, someone has to test these links. The song that I declare to be the official song of National Train day on No Facilities is “Southern Streamline” by John Fogerty. Southern Streamline feels like a train. The video has lots of train footage and the train is “bringin his baby back” and there ain’t nothing better than that. Happy Mother’s Day to my mom, my wife and all the mothers everywhere. Well, I learned something new, I didn’t know there was such a thing as National Train Day. Happy one to you! Thanks. I love trains. A few years ago, the AMTRAK museum train was in New Haven, CT on National Train Day. Different stations do different things but almost every station does something. Thanks for spreading the music today. Wow, is that an inordinate number of songs? I suppose if you looked, you could find a similar number boat themed tunes, or rocket ships, or race cars. But since I happen to have a soft spot for trains, I will entertain the notion that THEY command the top spot on the charts. 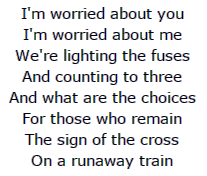 Jane Sibbery’s song, “Something About Trains” touches me too. Especially since she mentions “crow” another totem in my world. I tried to find a video of her singing. Nothing comes up after a quick google search. I think she must be very vigilant and protective of her recordings. That’s a great addition Maggie, thanks! I love crows too. A few days ago, I was out with our dog and three crows were tormenting her from a neighbor’s tree. They finally flew off and we just sat and watched until they were out of sight. Thanks, but Dang! It’s “not available” to me. But I’ve got the CD, so we’re good. I guess I don’t understand how these things work. I listened to it. It is a very lovely song. “My Baby Thinks He’s a Train” is a good addition. There are so, so many. Tennessee Flat Top Box, though, is not a train song. It’s a great song, but not about trains :) – Thanks for reading, commenting and adding a great song! Dan — i had not heard of National Train Day! Thank you, it’s so fitting for my serial. I loved the collection of train songs, and your commentary. Wishing you a satisfying Saturday. Thanks Teegan. I love trains. Maybe that’s why I’m enjoying this serial so much. Two great additions. Thanks John! And “Runaway Train” by Soul Asylum? And Quad City DJ’s “C’Mon N Ride it?” And if those are too new for you, how about “Sentimental Journey?” (I prefer Doris Day to Sinatra there, and I never say that! lol) Gah, I love that song! All good additions. I could probably do an entire post on “Runaway Train.” Thanks! Super great post Dan. I didn’t knew there was anything like National Train Day. Thanks for that additional information. In India, everything would come to a halt if there are no trains. I liked the train songs that you mentioned. Back here in India, we have movie songs that are shot in a moving train. I will certainly put them up on my blog, so you can view those songs and probably enjoy as well. Thanks Sharukh. We could benefit from many many more trains in this country. Yes, any country would. I believe the industrial revolution was possible mainly because of the railroad. That’s how most developed nations today became so prosperous, right? Glen Campbell’s ‘Wichita Lineman’. That’s about trains, isn’t it? I’m not much into country music. The Grateful Dead–now you’re talking! I’ll have to check but I don’t think “Wichita Lineman” is a train song. I think it’s a power line. Let’s just stick with “drivin that train…” Thanks for the comment. I just had a most enjoyable half hour listening to all your train songs! Love Roseanne Cash too. Happy Train Day – I rode an Amtrak while in America so I can say I’ve ridden your train line! Thank you! I’m glad to hear that you’ve been on our rails. Beautiful post Dam. Brought back many memories as I recalled the songs. Happy Train day. This post, right here, is a prime example of why I explore blogs and, in particular, follow you. How is it that someone else can pick a topic and write a piece that strikes so deeply when your reader never would have made the same connections? Gordon Lightfoot, Johnny Cash, Doobie Brothers, Arlo Guthrie and one of my utmost favorites – John Stewart – all of whom I’ve enjoyed time and again, but wouldn’t have connected to each other through trains. Would that we all gathered in a railcar with those greats for a jam session!! I’d add the Commodores with ‘Night Train’; Gladys Knight and the Pips with ‘Midnight Train to Georgia’ ; and how could you leave out ‘I’ve Been Wotking on the Railroad’ with Dinah blowing her horn which we always sang as part of our family car trip repertoire. i was so sad when John Stewart passed away too soon – his CDs are the most well-worn of my collection. So much more I could say; this post – like the midnight train whistle – will continue to reverbearate. Well done, Dan. I remember A Train, A Train, A Train, and this year’s followup is just as yummy. I can hardly wait for next year’s edition. Thank you so much Sammy! I don’t remember “Night Train” (I’ll be checking YouTube shortly) but I would happily add “Midnight Train to Georgia.” I was surprised at how many of my favorite artists had recorded a train song. I agree with you about the surprising benefits of exploring and following other bloggers. It’s so interesting to learn more about people and about things we thing we know. I hope yinz didn’t look too long because the Commodore’s song is Nightshift and it’s NOT on a train. It’s my whole John Stewart stream-of-consciousness that threw me off – I started watching his videos and remembering his song about Bobby Kennedy getting shot which made me think about another song about John & Bobby Kennedy and Martin Luther King, Jr. which I thought was by the Commodores called Night Train but their Nightshift song is about Marvin Gaye (I think!!) who also got shot. 5. And none of the above has anything to do with my drug use during the Doobie Brothers years (altho none of their songs seemed confusing at the time). LOL and there’s Marvin Gaye again !! I wish I could ‘like’ this post at least a Baker’s dozen times !! Ok, I found it. It’s not about Bobby and John and Martin ( that John Stewart / Bobby Kennedy stream again). It’s about Abraham (Lincoln), Martin luther King, Jr. and John Kennedy by Dion (another non-train classic). When you’re done riding the rails, look that one up on youTube. Don’t feel bad. I checked all of those links. After I pushed publish, I checked again and one was for the wrong artist and one opened the Google search page for the song. I fixed them but I’m still shaking my head. Thanks Cheryl. I had the idea for this post a long time ago, but I’ve worked and reworked it a number of times. I’ve pointed out before that I believe in these kinds of connections but lots of things can make me think of trains. I loved the photo of the crab you put up. Maybe we’ll get to see one of the dove? 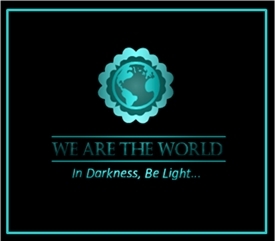 Love the John Prine’s rendition; although mournful, it has deep feelings. A little boy’s genuine longing. And the father’s answer is beautiful. Also, the last song, Southern Streamline. “Rollin’ steam and thunder/Ridin’ on that southern streamline”–I love it. Sounds fun. Thanks Peter – There aren’t too many train songs that I don’t like. Southern Streamline is just such an upbeat song that I had to give it the nod. “Paradise” is special to me because I lived close to the region where they were strip mining and it was sad to see what they did to the beautiful countryside. Ah, trains. I’ve been fascinated by them, like most of us, right from the start. I remember seeing the huge locomotive they have stashed in the Smithsonian when I was a kid, and of course model trains were always a great thrill. And now I ride a commuter train to and from work every day. Sure, it lacks the retro romance of the Orient Express, but it’s still cool. So it’s not surprising to learn that trains have inspired so many songs. 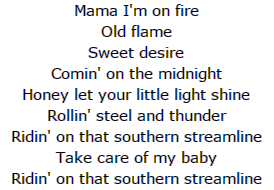 I’d like to mention Lynyrd Skynyrd’s “Railroad Song,” in which a character rousted by a local cop as a “hobo” sings about how he’s been “trying to learn about the old music from ridin’ the train.” Most of LS’s other songs were catchier than this number, but it’s not bad. Thanks Paul. You have given me some homework as I am not familiar with that song. I will be by tonight though. Thanks for adding to this post. Ha! Didn’t mean to give homework, but okay. :) So what did you think about the song? Well, I do have to say that you had me at Lynyrd Skynyrd. I don’t think they have a song I don’t like. As for a train song, once you add a harmonica (which I think I detected in there) you really have me hooked. https://www.youtube.com/watch?v=yOHGTZfU4xM Early Dylan train song . Great post . Thanks Dan. That’s another good addition to this post. I think I picked up 6 or 8 nice new songs in the comments. Great post. I love trains. I have had a love affair with trains ever since I was a little girl standing in my Mamaw’s backyard waving at trains and the train conductor waved back at me. It’s the only way to travel and really see the country wihtout having to drive yourself. I’m glad you enjoyed it. I still prefer trains to planes for any trip I can complete in one day. Absolutely Dan. Chatanooga Choo Choo was always a favorite of mine from the oldies era. I remember your post about trains from last year. This one could be as popular! Great idea to have included the songs that talk of trains. Trains fascinate people regardless of the countries. There are many good songs based on trains in France too. My most exotic train ride was in Kenya. Totally awesome to wake up with the sun in Africa aboard a train! Another great post, Dan. Thanks Evelyne! There are probably enough songs to do an A-to-Z challenge on train songs. Not my plan, but I guess it could be done. Unfortunately, the train from Washington, DC to New York derailed last night after leaving Philadelphia. I take that train several times each year. I think there are five confirmed fatalities and lots of people injured. No happy train songs today. I just like trains. I grew up around trains. I live around trains and I love hearing trains. Of course, they’re not in my back yard, but there’s just something about the sound of a train that makes my heart happy. I feel the same way about airplanes. Now, barking dogs and 4-wheelers . . . well that’s another story. A nightmarish kind of story. In other words, I don’t like barking dogs and 4-wheelers. What if the dog is barking at a train? Or s 4-wheeler? Do they cancel out? I love trains, and we are close enough to hear the whistle. We are in the landing path of BDL so we hear lots of planes (but I like them). Thanks. Sorry, nothing cancels out barking dogs and 4-wheelers. I’ve never had a thing for trains, but if you’re talkin’ songs that mention trains, my favourite is “People Get Ready” by the Impressions. “People get ready, there’s a train comin’, you don’t need no baggage, you just get on board, all you need is faith to hear the diesels hummin’, don’t need no ticket, you just thank the Lord.” It’s a beautiful song. There’s also a nice version by Jeff Beck and Rod Stewart (and I LOVE Rod Stewart), but the original is best. I remember that song. Consider it added to the list Wendy. So many good train songs. I have to ask, did you always like Rod Stewart or did he grow on you over time? I ask because I started out not liking him at all but I grew to like him a lot. Yes, I have always liked him. I can’t remember the first time I heard him, but I know that I’ve never NOT loved the sound of his voice (and his hair). I know that gravelly sound isn’t always people’s favourite, but it was truly love-at-first-listen for me with Rod!